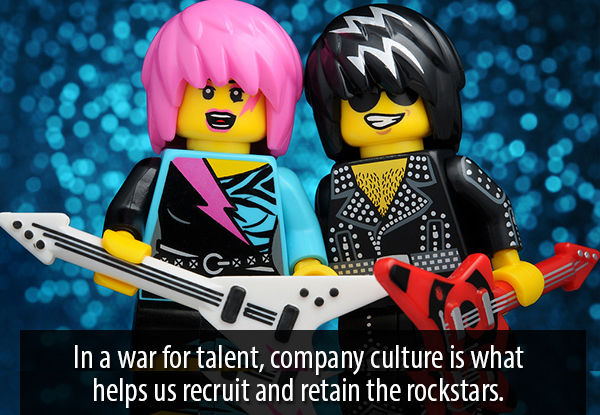 However, there is a way to win the war for talent, and it starts with company culture. As I learned from my nine year old's homework this week, company culture is an abstract noun. You can't touch it, can't hear it, can't see it, and can't feel it... well, at least with your fingers you can't touch it. But we all know you can definitely feel it. Most of us understand company culture to be the vision, habits, values, energy and customs which exist in the workplace. William Craig expands on this to say that company culture is also pre-existing; it's not something that changes when a new employee joins the company. It was there to begin with, even if it's a one-person show. Craig also states that the culture can grow and change over time. This change usually happens organically. But if a company is going to be recruiting, it's a good opportunity to look at the culture which is emerging and make sure you're happy with it. If any of you have been recruiting for tech talent recently, you know the pickings are slim for great people. A recent Forbes article explains why companies who don't have a talent management strategy are going to suffer. Our economy is near full employment, the war for tech talent is on and we are in a seller's market. As an inbound marketing agency, the people we hire have a myriad of skills which are not easy to come by. They’re usually digital natives, they're creative, analytical, have excellent writing skills, love learning, are competitive (they want to see you rank for your keywords as much as you do), they're team players and great project managers. Basically they walk on water. In a marketing sort of way. Needless to say, such people are hard to come by and a talent management strategy has been on our mind for awhile. We want to proactively do something to attract recruits (inbound style!) who are a good fit. And one way to do that, is to consciously create our culture. Here is the "Culture Code" we've come up with for ourselves. The list describes the type of workplace where we ourselves want to work, and since the code is also a reflection of our values, we're hoping it'll resonate with talented tech people of similar values, who are the ones we want to hire. I think Dharmesh Shah from Hubspot described it best at Inbound14 this past September when he said that "awesome people want to be ambitious; they want to achieve the impossible." Really good marketing agencies have bold goals. And we love to work with clients who have big growth plans. Go big or go home, right? It's a lot more fun to shoot for the stars and try to make it happen. Our ambition is compelling to the people who want to work with us because they don't want to be on a mediocre team either. I believe that's part of it. The other part of the vision, or story, that I believe is important to have is how a business is part of the bigger picture in life. What is it's mission or purpose? It's certainly not about getting more followers on Twitter or achieving a 41% open rate with our email newsletters (although we've done that...just saying...). Our mission is to help our clients, other SMB's and not-for-profits, to master the complicated world of digital marketing and leverage technology to generate new leads, thereby improving their marketing ROI substantially. And that affects their bottom line, which allows them to succeed and grow, and benefits them, their employees, and their vendors. And it's fun to make a big impact like that. I believe these two points work hand in hand because in order to encourage people to collaborate, you need to be transparent. Last year we implemented the Entrepreneur Operating System (EOS), which is explained in the book Traction, by Gino Wickman. It's taken some discipline, but it's been instrumental in creating a very collaborative environment because we all know what the goals are, who's responsible for which ones, and how far along we are in achieving those goals. Nobody wants to let anybody else down. And if one of us needs help moving our goal along, we say so and others are willing to pitch in. That collaboration has become a big part of our culture because we're all on the same page and understand what is driving the decisions that we make. Our team is creating the company we all want to work at together. It's a dynamic, partnership-like effort. We also expect our team to be transparent with us. If they're not happy about something, they need to be upfront and tell us so we can address it. Another key aspect of our company culture, is that we want to help our team fulfill their dreams. Whether it's mastering a certain skill, working with clients in a particular niche, having a schedule that allows them to pick their kids up at four everyday, or whatever. We try to incorporate our team's professional goals with our company goals. Happy people are much nicer to work with and much more productive. The other reason this makes so much business sense is because if our team is able to expand their skills and their network, it benefits the whole company. At Denamico for example, we know that most of our social media traffic comes from LinkedIn, and it's not from our company page (although it's pretty good). Rather, the majority of our LinkedIn traffic comes from the whole team working as company ambassadors, and sharing our content with their own networks. To not take advantage of this extended reach would be a big missed opportunity. We're creative people who like numbers, they're a bit of an obsession with us. Results are why we have clients. We analyze what we do and then we try to do better. We like to challenge ourselves and aim high. This is not to say we set unreasonable goals we'll never meet or that we're never happy, but we want keep raising the bar, keep innovating and be thought leaders in our field. For people who are a good fit with us, they like that. At the end of the day, or even the beginning of the day, we all want to work in an environment with good vibes. Not that everyday will be a 'good day' but as the famous quote from Confucius says, "Our greatest glory is not in never falling, but in rising every time we fall." Sometimes having perspective and maintaining a sense of humor is more important than anything else. I will be the first to admit that marketing is not rocket science or brain surgery. But it's not a cake walk either. In the digital and competitive world that we live in today, marketing is very complex. Had we not encountered challenges in recruiting the right talent, we probably would not have put so much attention on our culture just yet. But we believe it will serve us well because it clarifies in our mind what we want and what we're looking for when we add to the team. Image by Lynn Moore on Flickr; all rights reserved. Used with permission by photographer.